Between Saturday 20th June 2015 and Monday 29th June 2015 I crossed Bulgaria by train . This blog entry summarises my experiences, with the aim of assisting fellow travellers who might attempt similar trips. The map above shows my route, and the information is correct as of June 2015 – do comment below if you know if anything has changed! Bulgarian railways are old style, and generally rather slow. Modern railway comforts – like air conditioning or restaurant cars – are very seldom to be found. 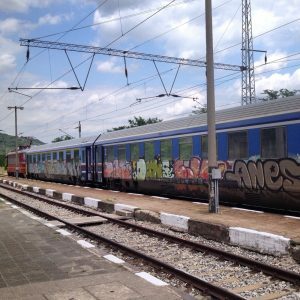 However if you want to see the landscape of the country, meet fascinating people, and feel the wind in your hair through an open window, and all of this on a shoestring budget, then a trip on Bulgarian railways is worth considering. Indeed considering the low ticket prices, and the very old rolling stock, BDZ / БДЖ (Bulgarian State Railways) actually works comparatively well! Bring your own loo roll, soap and water – most of the toliets on BDZ trains lack these. Also bring your own food – no catering is provided (except on the international services – see below), although sometimes stops are long enough to change locomotive to allow you to go to a café. While some internet tickets are now available for some routes, I bought all tickets with cash at the departure station – I could not buy a Plovdiv – Veliko Tarnovo ticket in Sofia for instance. Booking tickets for subsequent days does work – more details below. 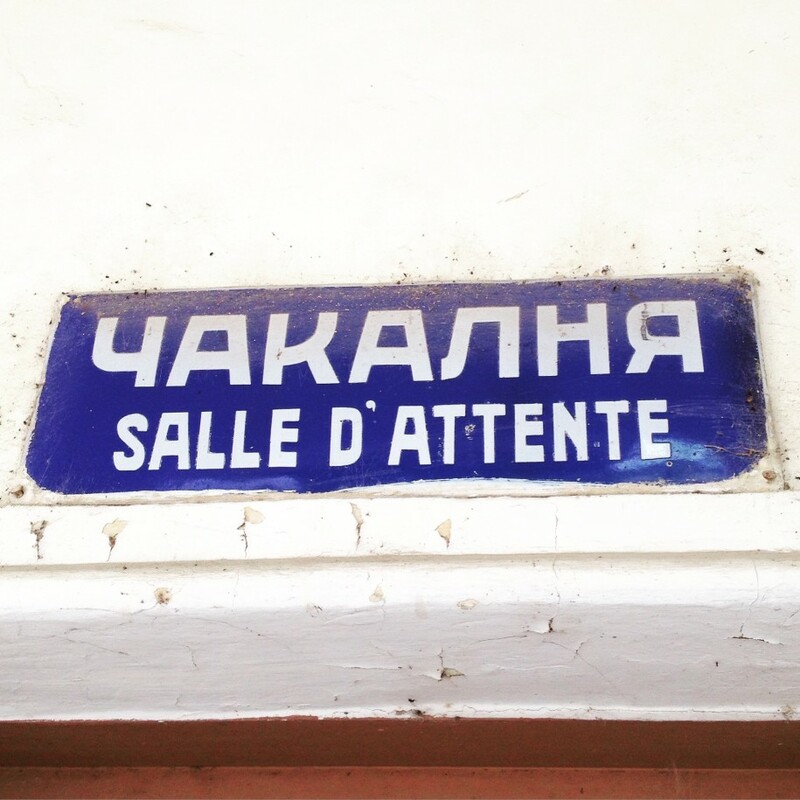 Few audio announcements are made in trains or at stations, so a basic grasp of the cyrillic alphabet helps – most trains have signs indicating the start and end stations next to the doors (see pic). This can be cross-referenced with the timetable information from DB’s Reiseauskunft that contains the times of all Bulgarian trains as far as I can tell. Saturday 20.6.15. D. 0655, A. 1600 approx (almost 3 hours late – timetabled 1420). International train 360 <- note NOT listed in DB’s timetable! Cost: €16.80, single, plus €1 for a seat reservation. This was the only train not booked through BDZ, but instead through Train OSE, the Greek railways (Train OSE international services page here). Paper tickets are issued at Thessaloniki station – there are no online tickets, and no savings made by booking ahead for single tickets (there’s a small saving for return tickets booked ahead). Two new, air conditioned but graffiti-covered carriages – a second class open car, and a first class compartment car – bound for Sofia are part of an internal Greek Thessaloniki-Alexandropouli service as far as Strimon (the border station) – ask staff at the station to make sure you are in the correct carriages. There is also a dining car as far as Strimon, but none thereafter. For some reason my seat was in the first class carriage, despite having a second class ticket – the guard didn’t quibble. This was the only service I took that encountered a major delay. 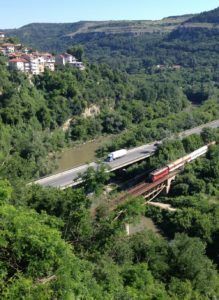 An accident at a level crossing north of Blagoevgrad (Благоевград) blocked both the railway line and the main road, and a rail replacement bus was laid on swiftly by BDZ to get us around the problem – along narrow mountain roads! – and then onto a waiting train at the next stop. If I had been travelling by bus I would equally have been delayed. Ticket purchasd at Sofia station a few minutes ahead of boarding the train. Train was composed of 1990s-style ex-DB German railways RegionalExpress carriages. The main parts of the carriages were OK, but stank rather badly of dirty loos, but fully open windows helped a bit! Scenery consists mostly of wooded hills for the first half of the trip, then agricultural plains. The least exciting and least eventful journey of the whole week. Ticket purchased the previous day at Veliko Tarnovo station. R 40105 was the worst train in the whole trip – very old and worn carriages with plastic covered bench seats in the compartments. 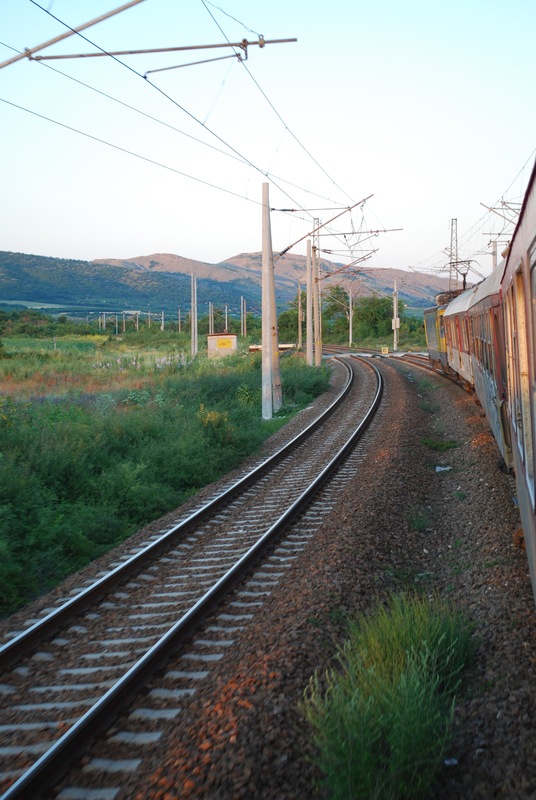 A passenger was taken ill en route, and the train reached Dabovo with an hour of delay, but R 3623 was held there for connecting passengers. 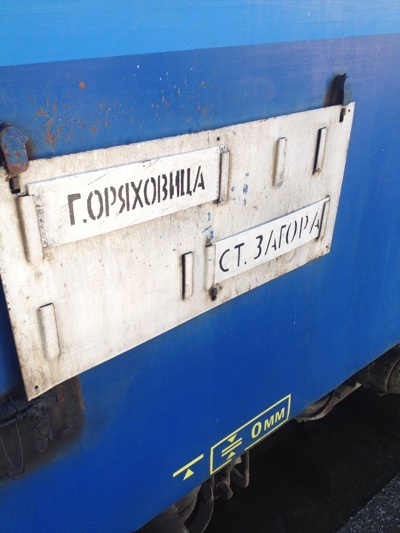 Dabovo – Burgas was in renovated compartment carriages that even had plugs to charge mobiles. A student who spoke perfect English helped explain the problems with the ill passenger – if in doubt try to ask people in Bulgarian trains, and you will find someone who speaks some English or German, and even if they do not the reaction I received was almost universally positive and friendly. The sun setting on the cereal fields of eastern Bulgaria between Karnobat (Карнобат) and Burgas was one of the sights of the trip. 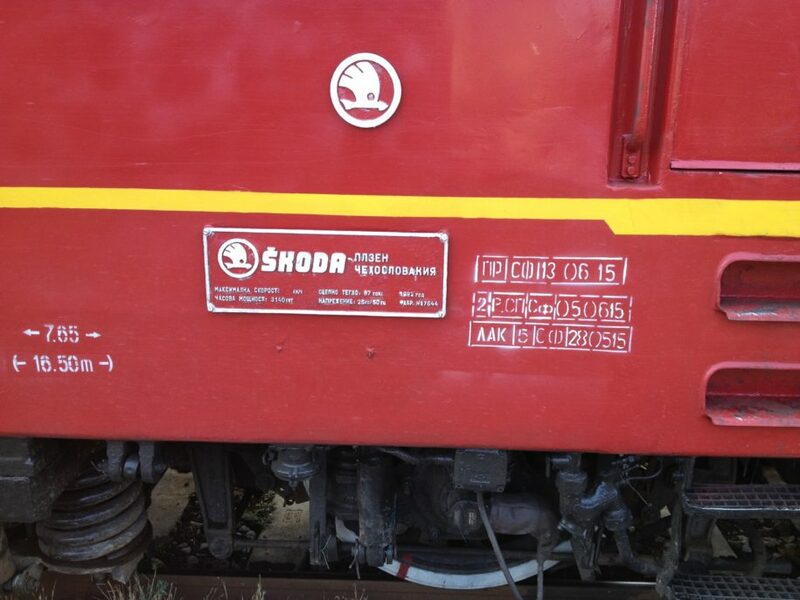 InterCity trains in Bulgaria are compulsory reservation – the ticket for IC 3602 was bought 3 days ahead of departure at Burgas station. 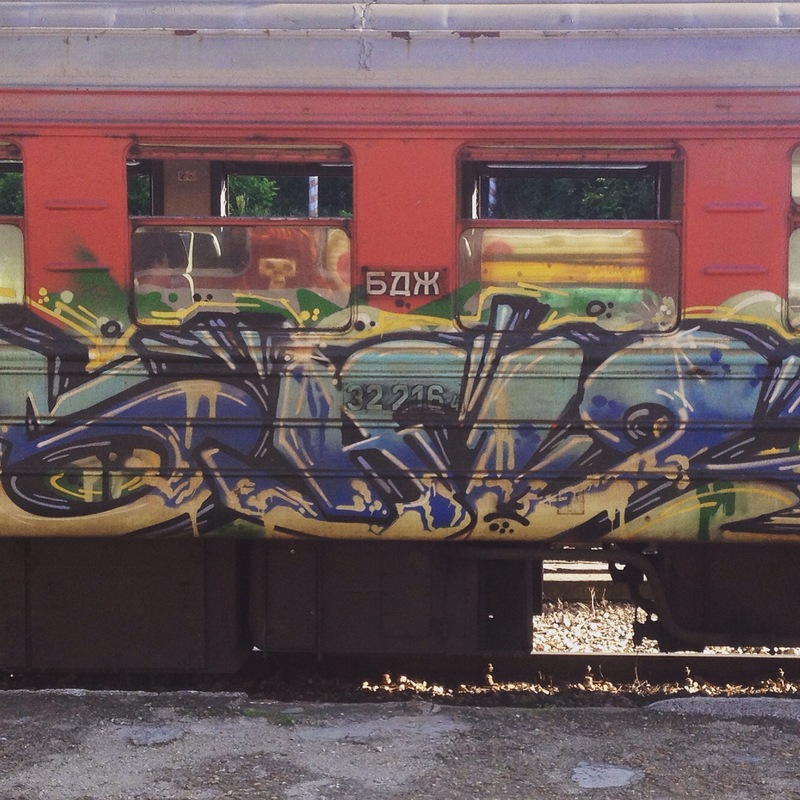 This train is like a slightly faster regional service – clean but old former East German carriages, and the route was via Karlovo (Карлово) through the hills of the middle of Bulgaria. The ticket for train 480 was also purchased from the international desk at Burgas that is staffed by a charming lady who speaks excellent German. Indeed getting a ticket for the 480 is complicated – theoretically it is bookable a month ahead, but staff at Sofia station refused to sell me a ticket for it on 22.6.15 for a 29.6.15 departure. The service itself is in a very old and worn out ex-East German couchette car and an even older compartment carriage, both of which are grimy outside but reasonably clean inside. Coffee, soft drinks and beer are available from the couchette attendant who also speaks decent German but little English. A strong lock is provided to secure the compartment overnight and – contrary to what the DB timetable says – the carriages do go as far as Budapest, and there is no need to change in Curtici. Train 480 is a mighty slow and inefficient train, featuring 6 different locomotives, 2 changes of direction, and a long shunting manoeuvre at Vidin before the border crossing into Romania. The scenery for the first two hours out of Sofia – along a deep river valley – is the best part of the trip. 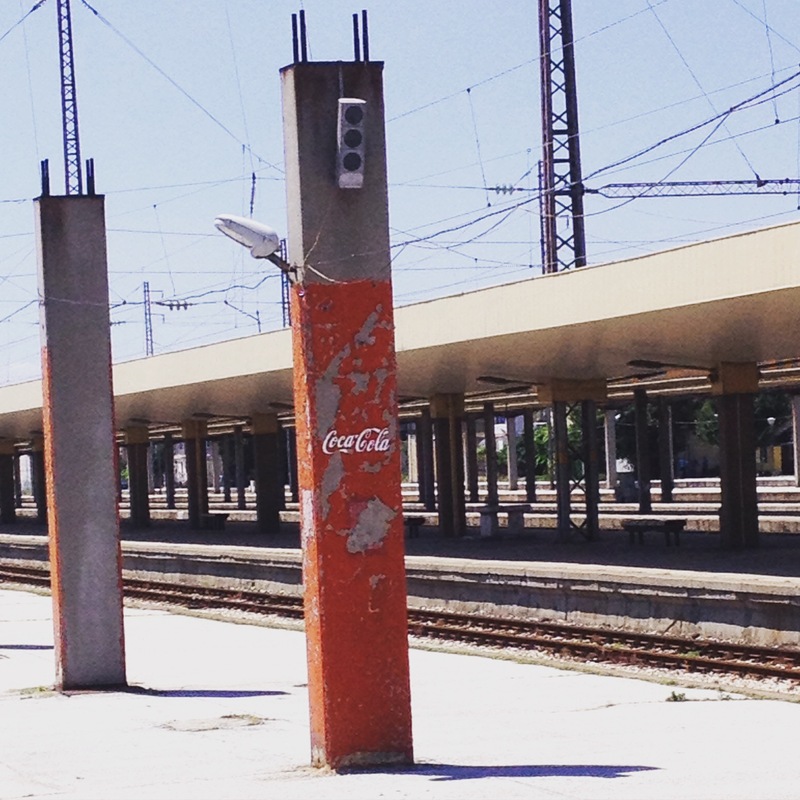 Ads for Coca-Cola at Plovdiv. I would like to ask your help to understand the time timetable, probably you have the same problem and in your trip. I sent some emails to BDZ but I don’t have any response. For example, this time table is from sofia to Thessaloniki. Do you know if the numbers 601, 361, 370 and 600 means? Is it the number of the trains? I need to take a train after 20:00 pm from Thessaloniki to Sofia, but I really don’t understand if there are a departure between this time. The number “601” has a departure 23:00 but there aren’t any addition information. Have you the same problem? Can you help me? where is Veliko Tarnovo on your map? I got lost there. Jon greg blog. 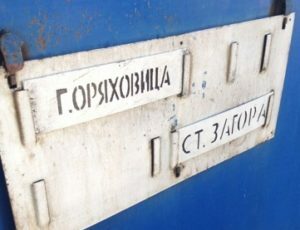 Do u have any information on the train firm Thessalonika to Svilengrad? That looks *complex*! If you want to go through Bulgaria then you’d better go from Thessaloniki to Sofia first, and then Sofia to Svilengrad (probably a night train for that part). There used to be a train from Thessaloniki to the Turkey border, but that does not run any longer – it only goes to Alexandroupolis these days. That is very useful information. Thank you. I was keen to go to,that part of Bulgaria. There is a new book out just reviewed in the Guardian Weekly – Border by Bulgarian New Zealand writer Kapka Kassabova . Maybe you have read it. I think I can go by bus around that way by the looks in Rome2rio site but not sure how safe it is. Do you have a feel for that? In Czech Rep you can pay (in CZK) in the train – if station desk is open and/or you came from outside country border you pay additional +40 CZK. 2+ people have better price, so do not buy separate tickets. Between larger stations include international tickets, you can buy at http://www.cd.cz e-shop. International tickets print to A4 paper, however for Slovak, Germany, Austria ticket on electronic device could be good enough too (same for domestic tickets). In e-shop you will get good prices between large cities and somewhere good prices for international tickets (Tábor-Bregenz/Villach,..). Almost all trains DON’T need seat reservation, except of SC(SuperCity) and trains of private companies RegioJet(regiojet.cz) and LeoExpress(le.cz), who operates between Praha-Ostrava-(Košice/Slovak) – they have better prices as state railways + they provide (especially RegioJet) some good buses, domestic and international for good prices. I plan to explore Eastern Europe from Kraków to Medjurgorje for a week. I would like to stop in Praque, Budapest, Zagreb and Medjurgorje. Dear Jon! Thank you very much for that interesting report. I had been to Bulgaria before, but back at those days the BDZ trains were not included in DB’s database. Still today, I would not trust too much on DB’s data, because BDZ is good at not telling DB about their construction timetables. In fact, something with the data export must have gone a little bit wrong, because the 4-digit “regional” trains are in fact according to BDZ’s own timetable fast trains. 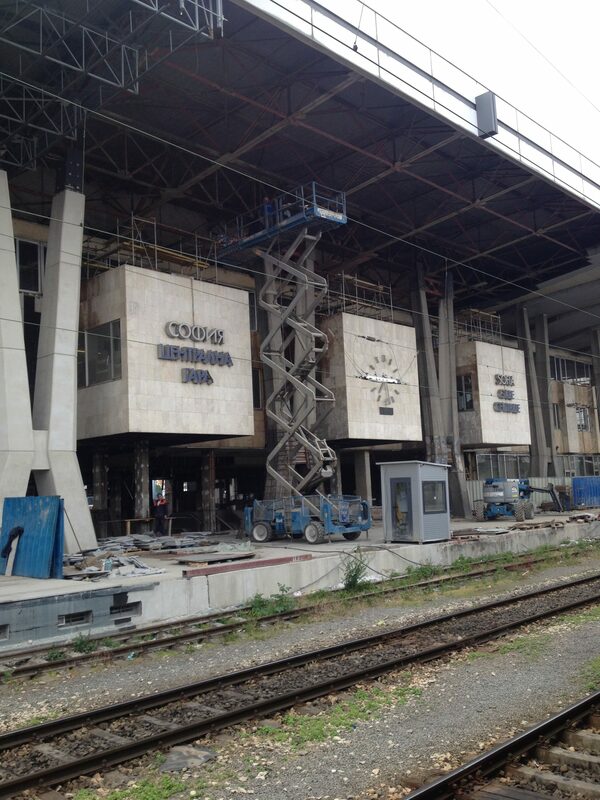 Train 8601 is usually a Sofia – Varna service, but now there seems to be some construction work going on near Stara Zagora. Train 3602 is one of BDZ’s premier trains and is called Чайка (seagull). Train 480 (the “Serdica”) could really perform better. 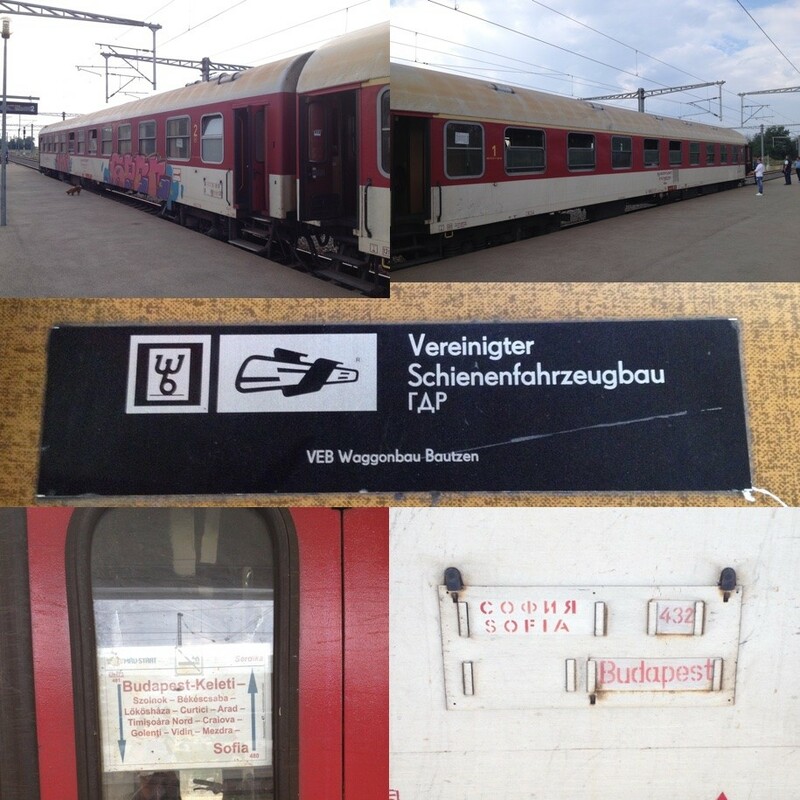 In spring and autumn there should be a Hungarian sleeping car (old-fashioned, but ok), but I heard rumours that they need it for the more important services from Budapest to the Adriatic coast. Unfortunately because of the bad timetable they would need 3 sleepers for that only train (one idles in Sofia during the night). That’s rather not what a European cross-border service should look like. I wonder what BDZ’s modern sleeping cars are used for. Maybe they are all used in domestic services.